Landings Restaurant is the latest target for thieves using heavy machinery to steal an ATM. 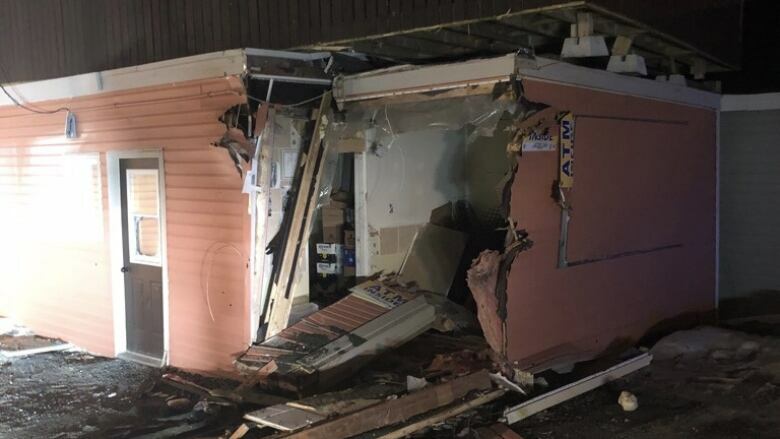 Once again, thieves have used heavy machinery to steal an ATM on the northeast Avalon, this time from a restaurant. Early Monday morning, a backhoe was used to tear open Landings Restaurant in Portugal Cove-St. Philip's. "It was a bit unnerving," owner Jim Parsons said of the 4 a.m. phone call from the Royal Newfoundland Constabulary. The report came into police about an hour earlier. The building is at the end of the wharf, and Parsons said it looks like someone took a nearby town backhoe and pushed in the wall, exposing the ATM. The machine was in an exterior wall, accessible 24 hours a day, and was used mostly by people needing cash for the Bell Island ferry. But Parsons wasn't concerned when he heard about a string of similar robberies last month, when thieves in heavy equipment hit a number of banks and a grocery store within about a week, because he thought the machine at his restaurant was more secure. "When we put it in there we actually poured a cement pad and bolted the machine to it, and the cement pad ended up out in the parking lot," he told CBC Radio's St. John's Morning Show. "So I guess when they plucked the ATM machine out of the floor, they took the poured pad with it, and somehow they got that free and clear, because it was about probably 12 feet or so away from where they took the machine. "It seemed like they did it very quickly, but they did a fair amount of damage," he added. Parsons doesn't own the ATM, and said he likely won't let anyone replace it. "I'm not gonna put an ATM machine back there," he said. "I'm not gonna subject myself to that."